BBC Future Media & Technology Director Ashley Highfield launches the iPlayer. The BBC's on demand TV service, the BBC iPlayer, will launch to the public on 27 July, the corporation has revealed. UK users will be able to download popular shows over the net seven days after broadcast to watch on their PC. Later this year, the service will also be available via links from YouTube and could also appear on other websites such as MSN, Bebo, and Facebook. At launch the application will only work on Windows PCs but a version for the Mac could be available by autumn. Over time other features will be added to the iPlayer including live streaming of programmes, the BBC Radio Player and "series stacking", which will allow users to download episodes from series retrospectively. Director General Mark Thompson said: "Forty years ago, in July 1967, BBC Television launched colour TV. "This July we are going to launch the iPlayer and in our view, the iPlayer is at least as big a redefinition of what TV can be, what radio can be, what broadcasting can be, as what colour television was 40 years ago." The iPlayer has been in development since 2003 and received final approval from the corporation's governing body, the BBC Trust, in April 2007. In that time it has been through numerous revisions, many demanded by the Trust and the broadcast and telecoms regulator Ofcom, whilst other broadcasters, such as ITV and Channel 4, have launched their own on-demand services. "The market badly wanted to make the BBC go through a proper due process," said Ashley Highfield, director of Future Media and technology at the BBC. He added that the long process had been "frustrating" but had ultimately made the iPlayer a "better" proposition. "Nobody wants to be the first to innovate and the last to implement but I don't think that matters," he said. "We are right at the beginning of the video over the internet revolution, these are really early days." At launch users will be able to download programmes seven days after their first transmission and will then have up to 30 days to watch them. Programmes will include popular series such as Life on Mars; soap operas such as EastEnders and documentaries such as Planet Earth. Initially, 400 hours of programming will be available. Some sporting events, such as Euro 2008, will be offered through the iPlayer as the service expands. Mr Highfield said that over a 2MB broadband connection half an hour of programming would take approximately half an hour to download. Once viewed in entirety, programmes will be automatically deleted. The lifetime of downloads is controlled by a digital rights managements system (DRM) supplied by Microsoft. Some critics of the iPlayer, notably advocacy group the Open Source Consortium (OSC), has said that programmes should be made available without these digital locks. However, Mr Highfield said this was not possible. 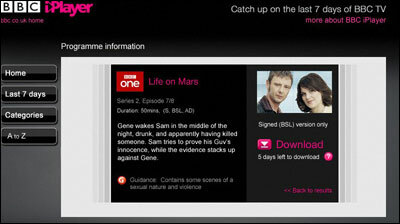 "We wouldn't be able to launch the iPlayer at all without digital rights management," he said. "The rights holders - the people that make the programmes, from Ricky Gervais to the independent producers that account for up to a third of our programming - simply wouldn't have given us the rights to their programmes unless we could demonstrate very robust digital rights management." The OSC has also criticised the BBC for initially releasing the iPlayer as a Windows-only system and has threatened to make a complaint to the European Commission. The OSC argues that the system should work on all computer operating systems. "I am fundamentally committed to universality, to getting the BBC iPlayer to everyone in the UK who pays their licence fee," said Mr Highfield. "This is the approach we have always taken but we have always started with the platform that reaches the most number of people and then rolled it out from there." Mr Highfield said that a version for Apple Macs could be available in autumn, with versions for Window's Vista and mobile devices to follow. Versions for Freeview and cable viewers are also planned with Virgin Media expected to roll out the service later this year. Deals with other distributors such as MSN, AOL, telegraph.co.uk, Tiscali, Yahoo, MySpace, Blinkx and Bebo were also in the pipeline, whilst a commercial iPlayer for global audiences could launch in 2008 he said. "Wherever you are on the internet you will come across BBC programmes," said Mr Highfield.